This week’s Trendy Tuesday was inspired by serious jewelry envy and a little stop at the hardware store with Mrs. Chanda. Yes, jewelry and hardware… mix those two together and you get one major fashion statement. Statement jewelry is a huge way to intensify an everyday outfit or any night time look. Stick with the industrial and bold look of the gold, aluminum and copper tones or mix it with pops of color for a beautiful juxtaposition of hard metal textures and bright colors. Below you will find some pieces Chanda and I found particularly unique and powerful, inspiration of hardware jewelry done right, as well as a DIY tutorial of some pieces my dad (YES, my dad) helped me conceptualize and create! Obsessed with the gold hose nozzles and leather combo! Short statement necklace with those large hardware pieces look simple, yet strong! See what I mean with that industrial gold and bold color! This silver “S” bangle humbly held and twisted together by gold wire embraces the pure metallic power of hardware. Cut the wire to desired length… single or layered! Make sure the opening is wide enough to fit your wrist! Now for the necklace! I loved the forrest green with the large copper and gold hardware! I put two equal pieces of the roped leather to add a layering aspect. 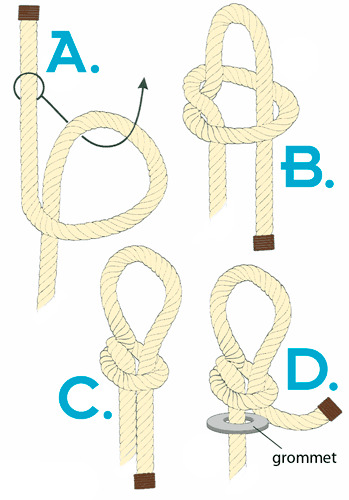 Slip knot time! Ideal for adjusting length size according to necklines.